Outdoor weddings in Santa Fe thrive on secluded surroundings and stunning southwestern vegetation. 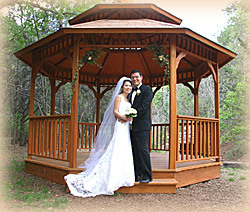 This wooden gazebo is a perfect setting for marriage ceremonies. 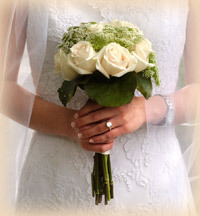 Our wedding coordinators will ensure that your garden wedding is a day of joy. Just minutes from the historic downtown Plaza, the park accommodates up to 80 guests in a tree-filled glade. We can cater an outdoor buffet at the gazebo or at another wedding reception site. "Our family and friends loved the site and ceremony..."